Successfully Added Ultrasonic Jewelry + Watch Cleaner to your Shopping Cart. 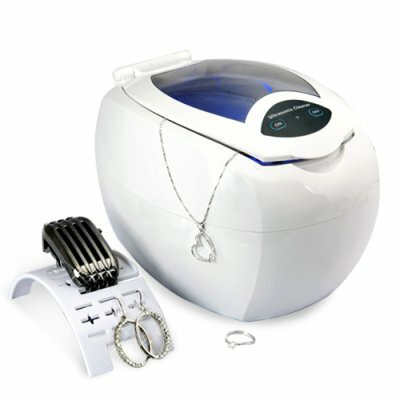 Our popular model CVASQ-CD6800-220V ultrasonic jewelry and watch cleaner with a new tray insert to make cleaning your valuables easier than ever before! Do you have some favorite necklaces or watches that really need to be cleaned but you find yourself lacking the time and money to take them to the jeweler to have them taken care of? Well, no worries, with the CD6800 Ultrasonic Jewelry + Watch Cleaner you can now take care of them in the convenience of your home. How does this product work? This fantastic new high-tech product emits 42,000Hz of ultrasonic waves that cleans almost any item in only THREE MINUTES. The Ultrasonic Jewelry + Watch Cleaner makes your necklaces, rings, earrings, bracelets, coins, glasses, watches and much more look as good as new. Note: This is a 220-240V product NOT suitable for USA-type 110V electricity supplies. If you are interested in purchasing the 100-120V version in bulk over 100pcs please contact the sales team. The Ultrasonic Jewelry and Watch Cleaner is not suitable for watches with less than 30 meters water proofing. Chinavasion accepts no responsibility for any damages caused by improper use. The constant high vibration water waves work wonders on almost any hard to clean surface. You must see it to believe it! This has been a popular resale item for me. Got nothing but good feedback.